COMMENTS: Before I insert the comments sent to me by Mark, I'd just like to interject one thing. Every now and again I pick up a puzzle someone else made which is just perfect in every respect, and makes me feel like I am a caveman working with a chainsaw in comparison. This is one such puzzle. Every angle, detail, cut, even the finish, is absolutely perfect. This is a superlative puzzle. The Ring of Diamonds puzzle was designed by Stewart Coffin, originally starting around 1973 and rediscovered in 1995. This is an improved variation of Mr. Coffin’s #13 (The General or Four Star) that uses rhombic sticks instead of triangular sticks. The Ring of Diamonds is numbered 13-B in Mr. Coffin’s list. According to his records he made a few in 1995. 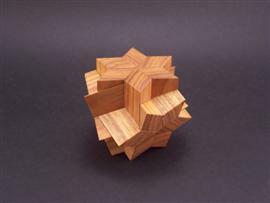 This puzzle is another of Mr. Coffin’s wonderful polyhedral puzzles which can be assembled to make a four star prism. 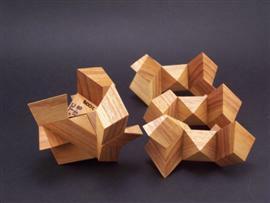 The puzzle consists of six differently shaped pieces and has only one solution. Mr Coffin described this version as neater and easier to make. I agree with the neater portion, but I’m not so sure about the easier to make part of it! This puzzle requires very accurate rhombic sticks at exactly 60 degrees. While this may seem like an easy task, it definitely is not. If the rhombic stick is 59.9 or 60.1 degrees, cracks appear on all star faces. This puzzle required two new jigs along with several others to make accurate stock and pieces. All of the copies were made from two different boards of canarywood. The puzzles’ sharp edges were carefully hand sanded. They have a thinned lacquer finish which was hand rubbed and then hand waxed with Renaissance wax for smooth operation and a nice feel to the touch. Truly a premium puzzle! Thanks again to Mr. Coffin for generously allowing the reproduction of his beautiful puzzle designs. Each puzzle is signed and dated by the artist.